For other uses, see APNG (disambiguation). The Animated Portable Network Graphics (APNG) file format is an extension to the Portable Network Graphics (PNG) specification. It allows for animated PNG files that work similarly to animated GIF files, while supporting 24-bit images and 8-bit transparency not available for GIFs. It also retains backward compatibility with non-animated PNG files. The first frame of an APNG file is stored as a normal PNG stream, so most standard PNG decoders are able to display the first frame of an APNG file. The frame speed data and extra animation frames are stored in extra chunks (as provided for by the original PNG specification). APNG competes with Multiple-image Network Graphics (MNG), a comprehensive format for bitmapped animations created by the same team as PNG. APNG's advantage is the smaller library size and compatibility with older PNG implementations. As of 22 June 2017, the only well-known web browsers not to support APNG are Internet Explorer (discontinued) and Microsoft Edge. In a comparison made between GIF, APNG and WEBP it was shown that APNG kept lower file size while keeping at least equal quality. The APNG specification was created in 2004 by Stuart Parmenter and Vladimir Vukićević of the Mozilla Corporation to allow for storing the animations needed for interfaces such as throbbers. In May 2003, Mozilla had scrapped support for MNG animations, which provides a superset of APNG functionality, citing concerns about the large file size required for the expansive MNG decoder library (300 KB); the APNG decoder, built on the back of the PNG decoder, was a much smaller component. Among users and maintainers of the PNG and MNG formats, APNG had a lukewarm reception. In particular, PNG was conceived to be a single-image format. APNG hides the subsequent frames in PNG ancillary chunks in such a way that APNG-unaware applications would ignore them, but there are otherwise no changes to the format to allow software to distinguish between animated and non-animated images. Some of the main concerns arising from this were the inability of applications to negotiate for PNG and APNG, or distinguish between PNG and APNG once received, or for legacy software to even inform users that there are additional frames. Glenn Randers-Pehrson spearheaded efforts to reconcile the PNG purists' position with that of APNG proponents by recommending changes to APNG's format and proposing the use of a unique MIME type (e.g., video/png), but the APNG proponents only added the different MIME type (image/apng) while insisting on the use of the .png extension instead of .apng, leading to the format not being approved by the PNG Development Group. The PNG group officially rejected APNG as an official extension on April 20, 2007. There have been several subsequent proposals for a simple animated graphics format based on PNG using several different approaches. Mozilla Firefox added support for APNG in version 3 trunk builds on March 23, 2007. However, because libpng is the PNG Group's reference implementation of the official specification, APNG support can never be supported in the main libpng distribution so long as it remains unratified by the Group. Iceweasel 3 supports APNG by using Mozilla's unofficial variant of libpng. The Logo of APNG Assembler, a free software to create APNG Images. Mozilla's role in extending the PNG format to APNG echoes Netscape's much earlier role in popularizing animated GIFs. In 2016, Apple adopted the APNG format as the preferred format for animated stickers in iOS 10 iMessage apps. On March 15, 2017 APNG support was added to Chromium. This leaves Microsoft Edge's EdgeHTML and Internet Explorer's Trident rendering engines as the only engines to not support the format. Firefox for Android Yes ? ^ After loading a video, an APNG file can be created via the "File|Export|Animated PNG" menu item. A server-side library exists that allows web browsers that support the canvas tag, but do not support APNG, to display APNGs. Examples of such browsers include Microsoft Edge and Internet Explorer 9. A PNG file consists of the PNG Signature (8 special bytes), followed by a series of chunks. A chunk consists of four parts: Length (4 bytes), Chunk type (4 bytes), Chunk data (length bytes) and CRC (Cyclic Redundancy Code / Checksum, 4 bytes). There are about 20 different chunk types, but for a minimal PNG, only 3 are required: The IHDR (image header) chunk, one or more IDAT (image data) chunks and the IEND (image end) chunk. The next graphic shows the contents of such a minimal PNG file, representing just one red pixel. The PNG signature bytes and the individual chunks are marked with colors. On the left side, the byte values are shown in hex format, on the right side as their equivalent characters from ISO-8859-1 with unrecognized and control characters replaced with periods. This dual display is common for hex editors. Note that the chunks are easy to identify because of their human readable 4-byte type names (in this example IHDR, IDAT & IEND). 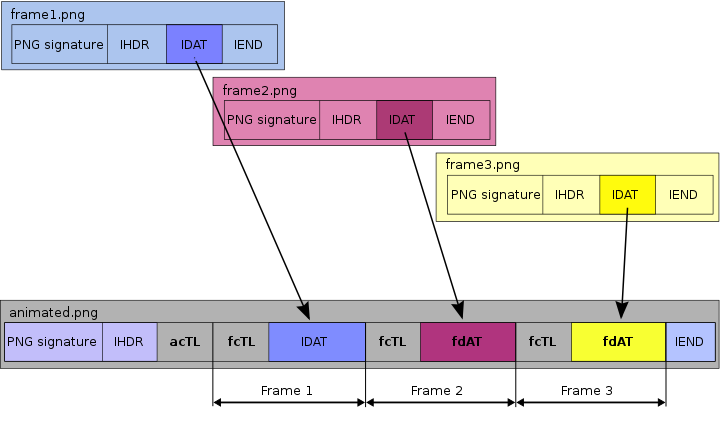 The APNG specification introduces three new chunks: The animation control chunk (acTL), the frame control chunk (fcTL) and the frame data chunk (fdAT). The animation control chunk is a kind of "marker" chunk, telling the parser that this is an animated png. It contains information about how many frames the animation consists of and how many times the animation should play before coming to rest. The frame control chunk contains several bits of information, the most important of which is the display time of the following frame. The frame data chunks have the same structure as the IDAT chunks, except preceded by a sequence number. Sequence numbers apply to both frame control and frame data chunks, which together follow a common sequence, thus enabling the order and timing of frames to be recovered should an APNG-unaware PNG editor re-order them as allowed by PNG chunk ordering rules. Take all chunks of the first PNG file as a building basis. Insert an animation control chunk (acTL) after the image header chunk (IHDR). If the first PNG is to be part of the animation, insert a frame control chunk (fcTL) before the image data chunk (IDAT). For each of the remaining frames, add a frame control chunk (fcTL) and a frame data chunk (fdAT). Then add the image end chunk (IEND). The content for the frame data chunks (fdAT) is taken from the image data chunks (IDAT) of their respective source images. The next diagram illustrates this process. The PNG specification was designed with future extensions in mind. An application reading a PNG file is supposed to simply ignore any chunks which it does not understand. This is the reason why APNG is backwards compatible. Existing applications just recognize the first frame and ignore the additional animation chunks. The MNG file format is a more powerful alternative to APNG, although it's a more complex format. It also has less web browser support. Mozilla and Netscape browsers removed the MNG support in 2003, and MNG support was never included in Google Chrome, Internet Explorer, Opera, or Safari. WebM, a video format, has been adopted by some sites such as 4chan as an alternative to other animated formats, including APNG. WebM VP9 supports both lossy and lossless compression, but no transparency. Google WebP also supports Truecolor with alpha channel animation. Dynamic graphics created with the HTML 5 canvas Object can also be animated. The APNG addon for Google Chrome uses this technique to display APNG images. CSS Animations is a proposed module for Cascading Style Sheets that allows for the animation of XML elements using CSS. ^ "GIF vs APNG vs WebP". littlesvr. Retrieved 2019-04-02. ^ martin (1999-11-11). "Bug 18574 - (mng) restore support for MNG animation format and JNG image format". Mozilla. Retrieved 2010-03-30. ^ "PNG (Portable Network Graphics) Specification, Version 1.1#8.4. Multiple-image extension". libpng. Retrieved 2010-03-30. ^ "APNG Specification, Version 1.0#MIME type". Mozilla. Retrieved 2017-12-10. ^ "ImageMagick can't detect animated PNG". Retrieved 2017-12-10. ^ "VOTE FAILED: APNG 20070405a". SourceForge mailing list. 2007-04-20. ^ "Discussion for a simple "animated" PNG format". Archived from the original on 2009-02-26. Retrieved 2011-07-12. ^ "Gran Paradiso Alpha 3 release notes". Mozilla. 2007-03-23. Archived from the original on December 26, 2009. Retrieved 2010-03-30. ^ a b "Debian Bug #486827 Iceweasel cannot render APNG image". Debian. 2011-08-26. Retrieved 2011-09-18. ^ "Digital Audio Broadcasting (DAB); MOT SlideShow; User Application (pdf) Specification" (PDF). ETSI. Retrieved 30 January 2013. ^ Inc., Apple. "Messaging - Extensions - iOS Human Interface Guidelines". developer.apple.com. Retrieved 2016-10-12. ^ "Anzwix / Chromium / Add support for Animated PNG". Retrieved 2017-03-15. ^ maxst. "APNG Assembler". SourceForge. ^ "cphktool APNG Anime Maker". cphktool. Retrieved 2010-06-28. ^ maxst. "APNG Disassembler". SourceForge. ^ maxst. "APNG Optimizer". SourceForge. ^ "GitHub changelog of FFmpeg". Retrieved 2016-07-09. ^ "Animated PNG: Simple Animation with an Alpha Channel". Gamani. Retrieved 2009-08-25. ^ "ImageJ News". ImageJ. Archived from the original on May 21, 2009. Retrieved 2009-05-23. ^ "Imagine - What's new". Archived from the original on October 8, 2011. Retrieved 2017-09-01. ^ "Konvertor - Solutions for Multimedia Processing". Archived from the original on 2010-05-12. Retrieved 2010-05-19. ^ "ksquirrel Changelog Sektion: ksquirrel-0.7.2". SourceForge. Retrieved 2009-05-23. ^ "Animated Image 2.4 - AGIF & APNG". Paint.NET Forum. ^ "SourceForge.net: VirtualDub APNG Mod". ^ While XnView is available for several operating systems, only versions for Windows have been released since APNG support was added. ^ "APNG export support". Retrieved 2018-09-18. ^ "Animated PNG graphics". Webkit. Mar 17, 2015. Retrieved 2015-03-17. ^ Parmenter, Stuart; Vladimir Vukicevic; Andrew Smith (July 4, 2008). "Animated PNG graphics". Mozilla Developer Center. Mozilla. Retrieved 2009-05-23. ^ "Firefox 3 for developers". Mozilla Developer Center. Mozilla. October 1, 2008. Archived from the original on 2008-11-13. Retrieved 2009-05-23. ^ a b c d e "Animated PNG (APNG)". Can I use... Support tables for HTML5, CSS3, etc. ^ "Add support for Animated PNG". ^ "Stable Channel Update for Desktop". Chrome Releases. Retrieved 2017-06-06. ^ "The status of APNG image format in Microsoft Edge". Microsoft Edge Development. Retrieved 2017-07-29. ^ "Web specifications supported in Opera 9.5". Opera Software. Retrieved 2009-05-23. ^ "Opera 46 goes final, more quality and Opera's first TV ad". Opera Software. Retrieved 2017-06-26. Wikimedia Commons has media related to Animated PNG.